Spring is a time that inspires poetry, imagination, and plans for what you’ll do when the weather really starts to warm up. It’s a time for spring cleaning, egg-shaped treats, and for trees to start showing signs of life. But spring is also a very serious time for your roof. Especially here in Dearborn Michigan where the snows pile on pretty high during the winter and spring storms can result in a challenging cycle of melt-off and new snow. Your MI home was inevitably built to handle a little snow. Your siding is winter-rated, your roof is steep enough to shake off at least a few flakes. But no matter how well-built your roof was originally, years of heavy, damp snow will eventually take their toll. That’s why inspections around the spring melt are so vitally important in all northern states. This is your first chance in months to get a clear look at your roof and identify anything that might mean you need repairs. Sagging under the weight of re-frozen snow, or piles that only half melt are remarkably bad for your roof, and any roof damage will need to be addressed before the next big spring storm. Which is why now is the perfect time to start planning for what to expect from your Dearborn roof this upcoming spring. 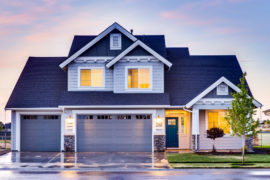 Today, we’re here to talk about what to look for that will tell you if roof damage somehow occurred over the winter or if the spring melts and storms are causing any additional damage. Before your ceilings fill with melted snow. Snow doesn’t always pile evenly on your roof, and it doesn’t always slide off evenly either. Diligent homeowners will sometimes brave the winter cold to wield a very long brush and pull piled snow off the rooftop. Most of us simply wait for the winter melt to take care of it for us. But this doesn’t always work out as planned. Keep an eye on your roof as snow begins to melt and watch for spots that do not slide off on their own. These are more likely to densely piled snow that may have partially melted and re-froze rather than simply releasing with the rest of the sliding roof snow. This can be the result of the wind making larger or smaller snow piles, or uneven ventilation inside your attic influencing which parts of the snow melt first. Either way, the danger is that these unevenly melting piles will trap moisture between the roof and the re-frozen top of the pile. This moisture, just like a pile of damp leaves on your roof in the fall, can soak into the shingles and even start causing wet-rot of the wood roofing beams below. In the chilly early days of spring, one of the best places to check for roof damage is inside your attic. And not just because it’s a little warmer. Even ventilation and insulation inside your attic are actually critical for maintaining a home in a region that snows because this is what discourages heavy piles and encourages an even melt-off. So the first thing to do is check for cold areas of your attic. If you can stand in a spot that is significantly colder from a draft — or lack of warm insulation — then you may have also found the source (or result) of dangerous snow piles on your roof. Next, check for dampness. If the spring really is causing snow piles to trap moisture, there’s a chance that you will be able to see the results on the wood beams inside the attic. Dark spots should be looked at in bright light and touched to confirm that there is water somehow getting inside your attic. Likely through compromised shingles that have been soaked-through since there shouldn’t be any plumbing up there to leak. If your roof piled high with snow over the winter, there’s a chance that the combined weight and moisture may have done more widespread damage to your roof than is easy to spot up-close. Maybe your shingles are fine but the weight of the snow managed to push down the spine or sag one surface of your roof. Often, the only way to get an idea if this has happened is to step across the street. Walk away from your house as far as you must to see your roof clearly. If possible, walk around the house to see your roof from different angles. If you see sagging or an area that looks ‘low’, this is a sign that your roof’s structure has begun to give way. You should also look for signs of ‘bending or drooping’ which may appear as sagging around the edges rather than a low spot in the center. 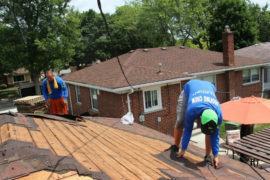 A sagging roof, even slightly drooping, is a sign that you need Dearborn roof repairs pronto. Roofs are built with overhangs and gutters precisely to keep excess moisture from sliding down your siding. While your siding may be rated for sideways-rain and several feet of snow, water actually running down your siding is a bad idea that could result ultimately in structural damage to both the walls and foundation. Whether you’ve got ice dams, detaching gutters, drooping corners, or can’t see the cause, damp siding is often a sign of roof damage. Keep an eye on the appearance of your siding. If one section seems darker, or it looks like water has been running down your siding, a roof inspection is a necessary first-step response. From there, you can figure out where your roof has failed to contain them melt-off. Then, of course, there are the spring roof concerns that can only be investigated by getting up close and personal. It’s dangerous to climb up onto your roof when conditions are wet or icy, but with a spotter you can safely do a few checks from the top of your ladder. Before you do any of these checks or work on some basic DIY spring roof maintenance, like breaking up snow piles, always make sure your ladder is absolutely safe. Clear a flat, non-muddy area where you can firmly place both or all four ladder feet on the ground without wiggling. Have a friend hold the ladder and keep an eye out for hazards. Let’s take a closer look and what the spring might have brought your Dearborn MI roof this year. Like birdsong and green buds on the trees, ice dams are something that always comes with a Michigan spring. Why? Because they are caused by partial melt-off and re-freezing. Something that we are very familiar with here with the cold early spring and returning spring storms. When the snow starts to melt off of your roof, it drips down into the gutter, which is further from your warm attic and has greater exposure to the cold air. So much in the same way that icecicles form, your gutters get clogged with re-frozen ice. 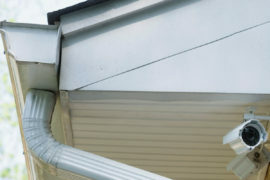 This is more likely to happen if there is debris in your gutters, but could happen to any Michigan home. The problem is that the built-up ice then stops melt-off and rain from flowing down the gutters, causing overflows and potential siding damage as we mentioned a moment ago. From the top of your ladder, it should also become clear whether large sections of your shingles have been damaged by slow-melt and sliding piles of snow. Shingles that have been softened and loosened over time under a damp pile of snow can then detach and slide fully or partially off with the patch of snow when it eventually falls. If this has happened, you may be able to see bare spots underneath the spring frost on your roof. Or rough patches where shingles have detached unevenly. You may also want to look for cracked and damaged shingles. The spring may bring hailstones, which will bruise and knock the granules off of composite shingles and can fully crack wood shake shingles. Spring is the perfect time to spot both winter shingle damage and anything new that came in with the springtime storms. Finally, try to get a good look at your flashing. That is the metal sheet ringing roof features like the chimney, exhaust pipes, and dormer-style windows. Over the winter, cold and moisture can cause old flashing to pull away from the roof and features themselves. Unfortunately, the purpose of flashing is to remain stuck-tight and prevent water from leaking in through the seams. If your flashing looks like it is dented, warped, or has pulled any distance out of place, it’s vital that you get it repaired or replaced immediately. Before the next storm or melt-off, as this is a direct avenue for water to enter your attic and home infrastructure. The spring is a rough time for rooftops, between the melt-off and the traditional storms. But it’s also the perfect time to get re-acquainted with your roof and to call for the first roof inspection or repairs of the year. 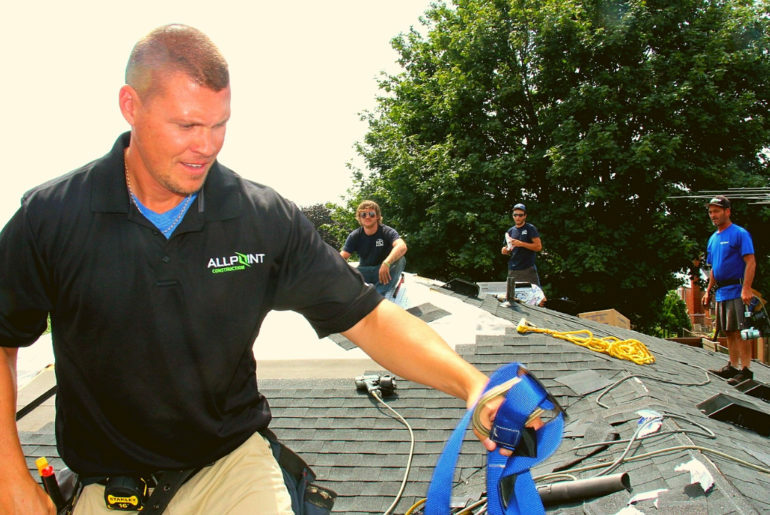 In fact, many people line up their spring roof repair appointment well ahead of time, assuming there will be some minor damage that can be taken care of quickly and efficiently by roofing professionals. 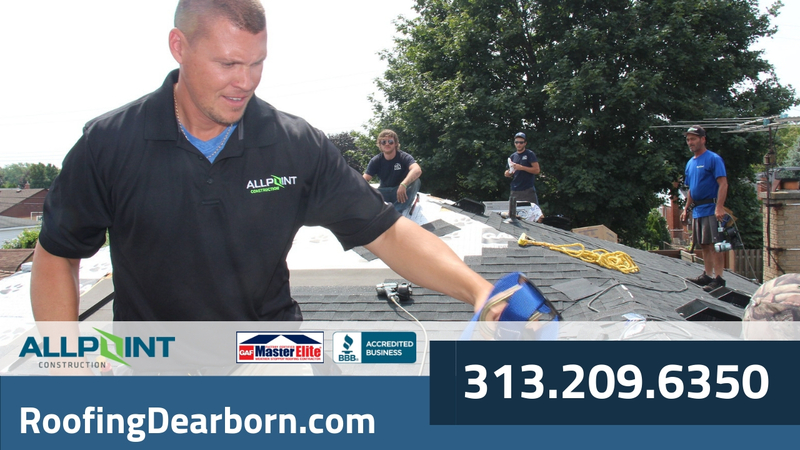 Here at Dearborn, we know the needs of Dearborn Michigan home rooftops inside and out. From the beams in your attic to the shingles on top. 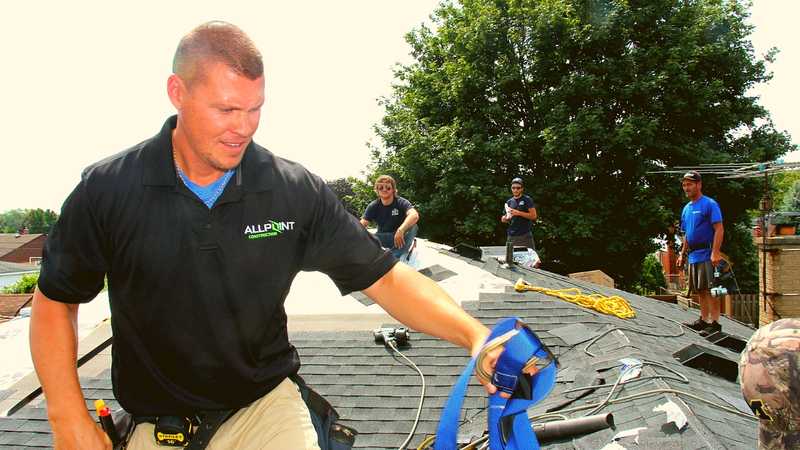 If you spot any signs of damage or want an expert’s assurance that your roof is safe to start the new year, contact us today! Our team will be delighted to perform a full inspection and advise on how to deal with any damage that was revealed with the spring melt. 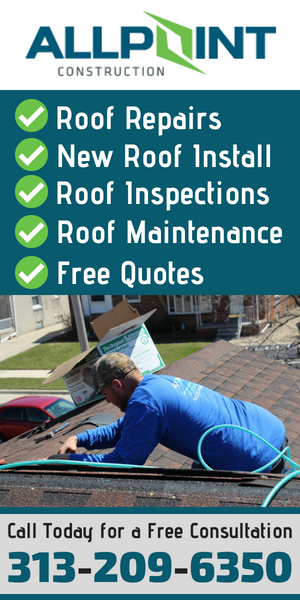 For a consultation, inspection, or more Dearborn roofing tips, contact us today!